A recently unveiled European patent filed by Apple describes a means of combining a fingerprint scanner with near-field communication technology, furthering rumors that Apple's next iPhone will integrate a novel form of security in order to set itself apart. International Patent No. WO 2013/130396 A2 describes an "electronic device with shared near field communications and sensor structures." It is derived from a U.S. patent application that was filed last year. 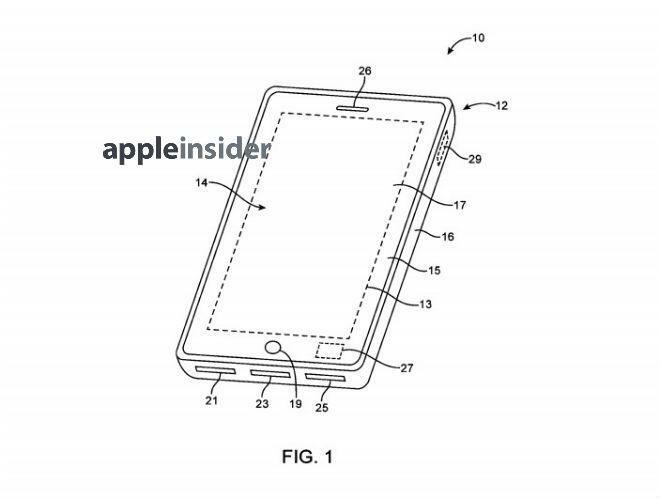 The technology discussed in the patent, spotted by Patently Apple, seems to align well with what industry observers believe will be the main security feature built into at least the higher-end model of iPhone that is likely to be introduced later this week. Consensus seems to have settled around a silver ring surrounding the home button on the "iPhone 5S." That ring, which has shown up in purported packaging materials and in supposed iPhone component leaks, is thought to house aspects of a fingerprint scanner that could take the place in many cases of a password. 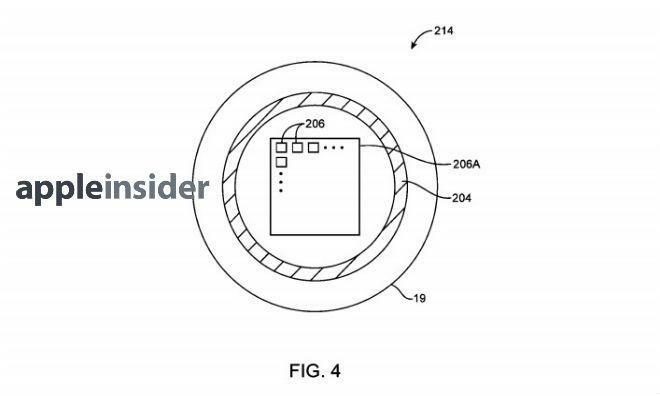 Notably, the European patent even depicts a metal ring around the home button, with its embedded sensor also displayed in the illustration. That matches exactly what analysts and commentators have come to believe will be the central feature of Apple's new high-end smartphone. Aside from simply unlocking the device or replacing a password in, for example, an iTunes transaction, the addition of a fingerprint sensor as described in the patent could open a range of new possibilities for using the device. 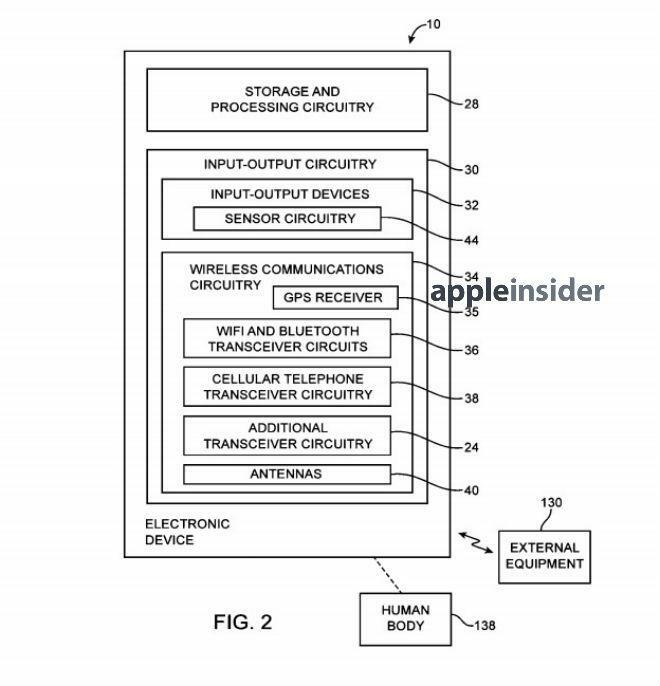 The pairing of the sensor with near-field communication technology could allow Apple to move into a range of different sectors. The patent discusses leveraging the NFC-biometric pairing to provide secure interactions involving wireless lock functions, wireless data synching, and security applications. Additional possible applications include pairing with headphones, interactions with vending machines, and verification of security badges. It also mentions the possibility of using NFC data for a wireless payment. That latter element could prove one of the most important functions an NFC-enabled iPhone could perform. NFC connectivity has been a feature in Android-powered phones for some time now, and Google and others have been attempting to push the technology as a mobile payment platform, to middling results. Google in particular has seen its efforts stymied by resistance from assorted wireless carriers, who are pushing their own competing mobile payment platform. Apple, meanwhile, has sat out the rush to integrate NFC, even though the iPhone maker is believed to have been working on integrating it with iPhones since 2010. Last year saw Apple unveiling Passbook, a digital wallet feature that stores tickets, store cards, and boarding passes. At the time, many observers puzzled at Apple's reluctance to take the extra step and integrate NFC. Some observers pointed out that security flaws in the NFC standard could allow for many phones to be accessed without user permission. Presumably, Apple's pairing of NFC with a biometric sensing security level would serve to mitigate some of that risk.